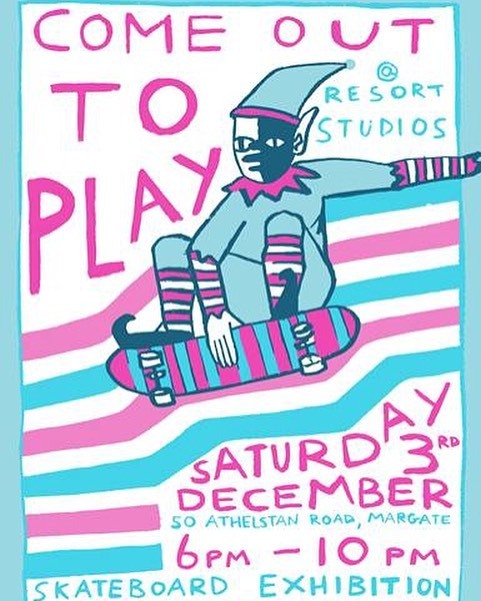 Come out to play is a group show of skateboard illustrations and artwork by Resort members and Margate artists, supported by Skate Pharm. The idea is derived from the Cult Film ‘The Warriors’ which probably needs no introduction here. New York gangs with names like ‘The AC Turnbulls’, ‘Baseball Fury’, ‘The Orphans’ and ‘The Lizzies’ costumed up ready to play. As a result, we wondered just for sh*ts and giggles what would this look like in Margate? The exhibition of skate decks will be hung on Friday 2nd December and will be open from Saturday 3rd December. The opening party will be that evening from 6-10pm with Urchin Wines, consequently doubling as a Christmas party for all. The show will be viewable during Urchin opening hours until the 11th Dec. Most importantly, the works will be on sale for £75 each with a 50/50 split between artists and Resort CIC. We would really appreciate your support as a way of raising much needed funds as Resort Studios looks to grow its public programme into next year.